The president of Guernsey Triathlon Club says he expects James Travers to be their "star contender" at next year's Island Games in Jersey. 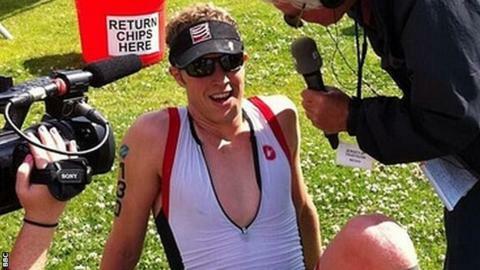 Travers came eighth in the British Triathlon Championships in Liverpool at the weekend and third in his 25-29-year-old age group. Guernsey are in the process of picking 10 athletes for the games next summer. "We're fairly confident that James will travel over to Jersey as our star contender," said Mark Naftel. "He's a really good swimmer, a really good cyclist and an outstanding runner. "He's a very fit young man and hopefully we can nurture him," Naftel told BBC Radio Guernsey. Travers only took up the sport two years ago, too late to be considered for this summer's Commonwealth Games. He which was one of two events, along with last week's Pembroke Triathlon in Guernsey, that the Island Games selectors are using to base their picks on. Naftel and his colleagues are hoping to make their selection by the end of the month to give their athletes enough time to train for the event. "We're a summer sport so we had to have our athletes qualify this summer for next summer's Island Games," he said. "The Games are relatively early in our season next year so we want our athletes to have a specific training programme for the next 10 months leading up to the Island Games."